Seeing, smelling, tasting, regulation of blood pressure – molecular switches are involved in all of these processes. The mechanism with which these proteins are switched off has been analysed by a research team at Ruhr-Universität Bochum (RUB), headed by Prof Dr Klaus Gerwert and private lecturer Dr Carsten Kötting. With the aid of infrared spectroscopy (FTIR) and computer simulations, they described the process at the subatomic level. The researchers published their report in the journal Proceedings of the National Academy of Sciences (PNAS). Bonded to the proteins, the energy molecule GTP is crucial for turning off many protein switches. If an enzyme cleaves a phosphate group from GTP, the protein switch is turned off. This so-called GTP hydrolysis takes place within seconds and is activated by a specific amino acid, namely the arginine finger. If that process fails, the patient might develop a disease such as cholera. 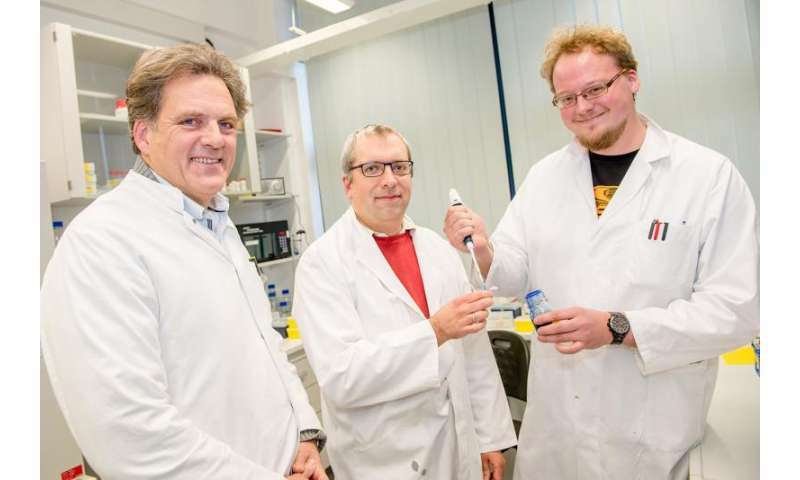 The researchers have now for the first time succeeded in describing in detail how the arginine finger works, using a combination of methods from the fields of biology, theoretical physics and experimental physics. One method established at the RUB Department of Biophysics enables the researchers to monitor enzymatic processes at a high temporal and spatial resolution in their natural state. The method in question is a special type of spectroscopy, namely time-resolved Fourier Transform Infrared Spectroscopy or FTIR. However, the data thus measured do not provide any information about the precise location in the enzyme where a process is taking place. Researchers can extract this information using quantum-mechanical computer simulations of structural models. "By combining theory and experiment, we thus gain a microscope with subatomic resolution," explains Klaus Gerwert. Using this approach, the researchers found out in detail how GTP hydrolysis is accelerated: rapid turning-off results in the arginine finger changing position, as if at the snapping of fingers. This result has a great significance, as the enzymatic process of GTP hydrolysis as molecular switch occurs frequently. The mechanisms of different switch processes in the body differ merely in details. GTP hydrolysis is, for example, also a switch for the Ras protein, the defects of which result in uncontrolled cellular growth in tumours. "By cross-referencing the results of our analyses of various switch processes, we continue to bring new details of GTP hydrolysis to light," says Carsten Kötting. The researchers used spectroscopy to visualise the state of the arginine finger bonded to the GTP molecule at high-precision, namely at one hundredth of the atomic diameter. The arginine finger snap has a considerable impact on the geometry and charge distribution of the bonding partner. "Our long-term aim is for our basic research to contribute to the development of drugs for the treatment of cancer and severe genetic diseases," concludes Daniel Mann, member of the team.